Ambedkar understands the Buddha's teaching that everything is characterized by Dukkha, or unsatisfactoriness, as referring specifically to interpersonal relations. 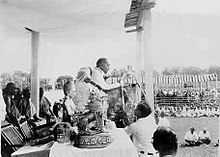 In one instance Ambedkar presents a dialogue in which the Buddha teaches that the root of dukkha is class conflict and asserts elsewhere that "the Buddha's conception of Dukkha is material." Nibbana (Skt. nirvana) the state or process which describes enlightenment, is considered [by Ambedkar] a precursor for moral action in the world and explicitly associated with a non-monastic lifestyle. Nibbana "means enough control over passion so as to enable one to walk on the path of righteousness." Ambedkar's interpretation of dukkha and nibbana implies that moral action, for which nibbana is preparation, will rectify the material suffering of inequality. ^ a b c Gary Tartakov (2003). Rowena Robinson, ed. Religious Conversion in India: Modes, Motivations, and Meanings. Oxford University Press. pp. 192–213. ISBN 978-0-19-566329-7. ^ Christopher Queen (2015). Steven M. Emmanuel, ed. A Companion to Buddhist Philosophy. John Wiley & Sons. pp. 524–525. ISBN 978-1-119-14466-3. ^ a b c d e f g h i j Eleanor Zelliot (2015). Knut A. Jacobsen, ed. Routledge Handbook of Contemporary India. Taylor & Francis. pp. 13, 361–370. ISBN 978-1-317-40357-9. ^ a b c Christopher Queen (2015). Steven M. Emmanuel, ed. A Companion to Buddhist Philosophy. John Wiley & Sons. pp. 524–529. ISBN 978-1-119-14466-3. ^ Christopher Queen (2015). Steven M. Emmanuel, ed. A Companion to Buddhist Philosophy. John Wiley & Sons. pp. 524–531. ISBN 978-1-119-14466-3. ^ Yashwant Sumant (2004). Surendra Jondhale; Johannes Beltz, eds. Reconstructing the World: B.R. Ambedkar and Buddhism in India. Oxford University Press. pp. 74–75. ISBN 978-0-19-566529-1. ^ Christopher Queen (2015). Steven M. Emmanuel, ed. A Companion to Buddhist Philosophy. John Wiley & Sons. pp. 529–531. ISBN 978-1-119-14466-3. ^ a b M.B. Bose (2017). Tereza Kuldova and Mathew A. Varghese, ed. Urban Utopias: Excess and Expulsion in Neoliberal South Asia. Springer. pp. 144–146. ISBN 978-3-319-47623-0. ^ Jim Deitrick (2013). Damien Keown and Charles S. Prebish, ed. Encyclopedia of Buddhism. Routledge. p. 25. ISBN 978-1-136-98588-1.